The anticipated low pricing and strong order book underscores the financial strength of the world’s largest -- and most profitable -- oil company. The yield on the Aramco bond is expected to be less than Saudi Arabia’s sovereign debt, which is highly unusual for a state-owned company. Aramco is expected to raise $10 billion to $15 billion in the sale, which will price later today. The strong demand opens the door for the company to go even higher. By comparison, CVS Health Corp., Anheuser-Busch InBev NV and Verizon Communications Inc. all drew orders in excess of $100 billion, but also each borrowed at least $40 billion in their respective M&A transactions. 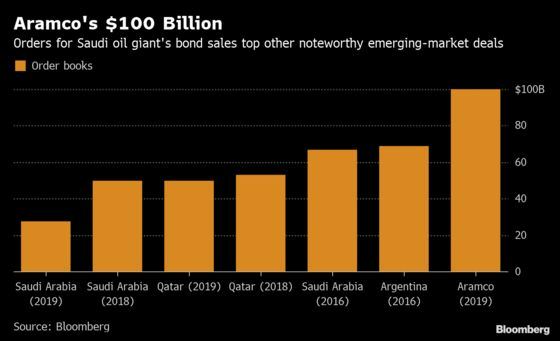 Aramco received the strongest demand for longer-dated, highest-yielding bonds, which are effectively are a bet on Saudi Arabia and oil around the year 2050. Longer-dated bonds are usually popular with pension funds and insurance companies seeking to match the duration of their assets and liabilities. The deal is largely seen as Plan B to raise money for the Saudi Arabia’s economic agenda after the initial public offering of Aramco was postponed. In effect, Saudi Crown Prince Mohammed bin Salman, who runs the country day-to-day, is using the state oil producer’s pristine balance sheet to finance his ambitions.